Beautiful Home in a 5 Star All Age Community! 3 bedrooms, 2 baths, fantastic floor plan. New carpet in bedrooms, laminate wood floors in living areas. Large living room, bonus/family room and a beautiful kitchen open kitchen. Kitchen includes all appliances, breakfast bar. Dining area features a beautiful built-in hutch. Indoor laundry room with washer and dryer included. Spacious master suite features a private bathroom. Fenced yard, deck to enjoy your morning coffee, central heat and air. End of dead end street location provides privacy and peacefulness. This home is priced to sell today! Charming home with two bedrooms and one bath! Kitchen is light and bright and includes appliances. Large living room, bathroom has washer and dryer in it. Bedrooms are located at either side of the bathroom. Large patio to enjoy a BBQ. Very large enclosed porch is the perfect spot for an office or a hobby room. Homes in this community are selling for very high prices, this is an affordable home in a highly sought after community. All ages welcome! Own the land as well as the mobile home. Pride of ownership shows throughout the home. Owner updated siding, roof and flooring. This home is in excellent shape. Master suite with private bathroom, walk-in shower, guest bedroom and bathroom. Indoor laundry room includes washer and dryer. Bright and airy kitchen includes all appliances. Large living room with attached bookcases, separate dining area. Enjoy views of the Sweetwater Reservoir from your living room! What a deal! 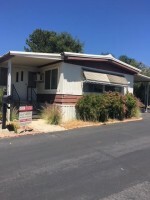 Triple wide manufactured home in Bonita Hills Estates. Home has been priced below market value to sell fast. Remodeled homes in this community are selling for over $120,000. Approximately 1720sf of great living space. Family room features a wet bar (perfect for a coffee bar). Enjoy the view of the Sweetwater Reservoir from your living room or your deck. Very large dining and living rooms. Spacious kitchen with tons of cabinetry/counter space, 3 ovens, dishwasher, refrigerator and stove. Indoor laundry room includes washer and dryer, extra refrigerator and 2 pantries. Family/bonus room has access to deck through sliding glass doors. Dual master suites! Main master suite features a large walk-i closet with mirrored doors and a private bathroom with dual sinks, walk-in shower and garden tub. Second master suite offers a walk in closet and private bathroom with a walk-in shower. View deck, large carport, central heat and air. NO PROPERTY TAX as this home is on a yearly Dept of Housing registration. Don't miss out, call to view today! This beautiful home is priced to sell fast! Fantastic split floor plan with bedrooms and bathrooms at each end of the home. Large eat-in kitchen with ample cabinetry/counter space. Side by side refrigerator, stove and dishwasher are included. Laundry room includes washer and dryer plus overhead cabinetry. Large open living room with lots of natural light coming through the windows. Spacious master bedroom features a walk-in closet and a private bathroom. Good size 2nd and 3rd bedrooms, guest bathroom and central air for those hot days. This all age community offers a playground, swimming pool and clubhouse for your enjoyment. Call today, this home won't be on the market long! Stunning split floor plan home with bedrooms at each end of the home. Huge side yard, fenced yard and central heat and air! You will be proud to call this "home". One owner home, and pride of ownership shows throughout. Home was recently painted, high efficiency dual pane windows were installed on the sunny sides. Beautiful kitchen with large pantry, breakfast bar and all appliances are included. Spacious dining area, large living room features a dormer window. Great wood laminate flooring throughout the home. Indoor laundry room includes washer, dryer and overhead cabinetry. Master suite features a private bathroom, large tub/shower and walk-in closet. Enjoy your morning coffee on your own deck. Dream side yard offers a sitting area, beautiful trees and plants, as well as artificial grass. Storage shed and large carport. Priced to sell today! This is the home you have been waiting for! Brand New 2017 Cavco Manufactured Home with fantastic floor plan. Space rent $735. Gorgeous home with front porch entry. Stainless steel kitchen appliance package includes microwave over the stove, dishwasher and large refrigerator. Rich chocolate brown wood cabinetry, indoor laundry room, wood-like vinyl flooring throughout. Master bedroom with private bath. Guest bedroom and bath, plus a den with french doors. Factory built front porch. We added central air conditioner for those hot days! Renovate and save! Fantastic deal on this home in an all age community close to downtown El Cajon. 1 bedroom, 1 bath, expanded living room, large eat- in kitchen. Large enclosed porch with washer/dryer hookups. This home will sell fast, call to see today. Priced to sell today! Well maintained home in an all age community located near Highway 67 and Parkway Plaza. This beautiful home features 3 bedrooms, 2 baths, plus a spacious enclosed porch. Indoor laundry room includes washer and dryer, large carport and two storage sheds. This home will sell fast! Available Now! Pride of ownership shows throughout the home, split floor plan with bedrooms and bathrooms at each end of the home. Open concept floor plan with large living room. Beautiful kitchen with ample cabinetry and counter space, all appliances are included as well. Indoor laundry room with washer and dryer included. Spacious dining area, 3 bedrooms and 2 bathrooms. Feel the ocean breeze and enjoy living close to the ocean. This all age community is near Highway 5, great shopping and dining near by. Price Reduced from $99,900! Beautiful 2 bedroom 2 bath home in a very desirable Mobile Home Park in the heart of the City of El Cajon. Amazing 2003 manufactured home.This two owner home is in great condition! Spacious kitchen with beautiful cabinetry and all appliances included, side x side refrigerator with water and ice on door. Great living and dining areas with covered front porch entry. Master bedroom has wall to wall closet plus a private bath featuring a bathtub/shower combination plus a linen closet. Large second bedroom and bath. Indoor laundry room with washer & dryer included. Covered front porch plus an open deck on back to enjoy the sunny days! Space rent includes water & sewer. This well maintained senior community is the envy of El Cajon. Superb management and resort like club-house. Enjoy reading a book in the in-house library or next to the fireplace. Join the many resident activities. Don't sacrifice luxury, this home is luxurious throughout! Located in the beautiful upscale community of Alpine Mobile Home Estates. Before stepping into the home from the front porch entry, one can see this home is in impeccable condition. Vaulted ceilings, indirect lighting, dual pane windows with custom window coverings. Electric fireplace, ceiling fans, skylight, dormer windows and stainless steel appliances. Laundry room includes the washer and dryer, plus tucked away neatly is an extra refrigerator, copper plumbing. This home features a gourmet kitchen, formal dining and living rooms, a lovely study/office. Extra wide hallway leading the way to the master suite via french doors. Master suite offers a large walk-in closet with built in cabinets. Guest bathroom offers a shower/tub combination while the master bathroom has a garden tub and walk-in shower plus a private bathroom. Front porch is the width of the the home, side porch is off the laundry room. The shed was custom built to match the home, and it is insulated! Well thought out landscaping in front and back with Drip system in back, masonry skirt, decorative colored cement, fenced backyard, very charming and enticing. The home has been recently painted. This is an amazing home and will sell fast. Move in ready. Renovate and have instant equity! This is a very charming home located in a great corner lot. The sub flooring and flooring have to be replaced due to a flood that happened years ago. This home has a good size kitchen with breakfast bar, a very large bedroom and a spacious living room. Used to be a 2 bedroom home; however, the two bedrooms were merged into one large bedroom with retreat. Enclosed porch is a great place for your hobbies, sewing room or office. Back yard is the perfect place to entertain. This home will sell fast! You don't have to sacrifice luxury when downsizing! This amazing brand new manufactured home offers beautiful kitchen with rich dark cabinetry and ample counter space. Stainless steel appliance package including side by side refrigerator, gas stove, microwave over the stove and dishwasher. Large living and family rooms, spacious master suite with walk-in closet and private bathroom with walk-in shower. Guest bedroom and bathroom as well. Price includes sales tax! Call to see today as this home will sell fast. Charming home in a very sought after senior community in East County. Expanded living room, large main bedroom, large eat-in kitchen. All appliances are included. Pictures coming soon! Stunning 2004 1546sf manufactured home located on a cul-de-sac across from guest parking. Adult 55/18 community. Huge kitchen with ample cabinetry/counter space, pantry, island and all appliances are included; breakfast nook, recessed lighting, gas stove, built-in oven and microwave oven. Master suite features a private bathroom with a walk-in shower and a walk-in closet. Guest bedroom and bathroom. There is a huge dressing room with ample shelving, clothes' hanging rods and a pocket door. Laundry room w/sink & storage, includes newer washer and dryer. Ceiling fans, central air and heat, vaulted ceilings, dual pane windows. Enjoy your coffee on your own covered deck with durable composite decking! Low maintenance yard, beautiful integrated storage shed, wheelchair ramp, and large carport. Amazing home priced to sell fast! Great deal on a fixer upper - Low Space Rent. Home has spacious floor plan. Large bedrooms. Windows has been upgraded to dual panel. Roof was recapped. Gorgeous 2 Bedroom, 2 Bath home in a well maintained community under Chula Vista rent control.This home has been well cared for, and it offers many great upgrades. Interior drywall throughout, wet bar, skylights in both bathrooms along with walk-in showers, mirrored wardrobe doors in both bedrooms and master bath. Kitchen features granite counter tops, beautiful custom white wash cabinets, and a breakfast nook. Laminate flooring in entryway, kitchen and hallway. Enjoy the bonus room, it would make the perfect office, tv or hobby room. Two storage sheds, extra wide driveway, dual pane windows, lovely covered porch is the perfect place to sit and enjoy your morning coffee. Back yard is fenced, and there is a pet door leading to the yard. All appliances are included, refrigerator is like new! Roof was resealed in December 2017. This home is a must see! Call Shannon to view this home 619-218-9924. WOW! Enjoy the ocean view and breezes from your living room and from the front deck. This home is located at the end of a cul-de-sac and has the most amazing ocean views! Beautiful kitchen with deep drawers and all appliances are included. Love to entertain? Your bonus room comes equipped with a wet bar. Large living room, spacious dining room featuring a built in china cabinet. Laundry room comes ready with a washer and dryer. Beautiful guest bathroom with a walk-in shower, and it can be accessed from the guest bedroom as well. Master bedroom features a private bathroom with dual sinks, walk-in shower and a beautiful tub; in addition, there is a large linen closet. Enclosed porch is the would make the perfect sewing or hobby room. Nice patio located behind enclosed porch, front porch entry and large yard. Call to see today, ocean view properties sell fast! OCEAN VIEW PROPERTY AT THE END OF A CUL-DE-SAC. Stunning 2006 Palm Harbor Manufactured Home with canyon views. Fantastic open floor plan with very large gourmet kitchen. Ample cabinet/counter space; additional built-in pantry, recessed lighting, solar tube and under cabinet lighting. All appliances convey, including a reverse osmosis water purification system. Dining area features the most beautiful ceiling fan and custom built wall to wall cabinetry. Large living room offers views of the canyon and a ceiling fan. Laminate wood flooring in living areas and hall, dual pane windows, central air and heat. Amazing master suite features a walk-in closet and an en-suite bathroom; large garden tub, linen closet, extra closet. Hall coat closet, ceiling fans in all bedrooms. Amazing canyon views from your own factory-built covered deck. Full perimeter concrete foundation, brick patio, storage sheds galore, fenced low maintenance yard. Freshly painted exterior, alarm system (approximately $25 a month). Extended carport supports. Pride of ownership shows throughout! Stunning home in Terrace Estates senior community! This home was renovated about 3 years ago, and it has so much to offer its new owners. Wheelchair lift from carport to deck, dual pane windows, capped roof, convenient side by side freestanding carport, newer appliances; whole house water softener system, reverse osmosis water filtration system. Motion sensor security lights, Tuff storage shed, a large deck to enjoy your morning coffee and fruit trees(grapefruit, lemon and blood orange). Large living room includes wall-mounted flat screen television, bonus room is the perfect place for an office or breakfast room. Beautiful kitchen includes all appliances, sliding drawers, microwave oven over the stove. Master suite offers a walk-in closet and a private bathroom with an over sized walk-in shower with movable bench and glass doors. Large guest bedroom, spacious guest bathroom. 3rd bedroom was converted into a large utility/laundry room, and there is ample space for a freezer, sewing space and more. Don't miss out on this amazing home! Storage and built-ins galore. The home is very bright and airy. Beautiful eat-in kitchen includes refrigerator, stove and microwave. Spacious living room, large main bathroom features a shower stall. Main bedroom has a large closet and a built-in vanity. Second bedroom has a half bath and has access to the enclosed porch. Close proximity to the community center. Great senior community features a swimming pool, clubhouse, guest parking, laundry onsite. Accepts two pets. Low space rent! Fantastic open floor plan. In need of paint, flooring and appliances. 2000 Fleetwood manufactured home in Bayview all age community. Live near downtown San Diego at an affordable price. Estimated land fee is $850. Spacious living room features a dormer window, and a ceiling fan. Front porch entry, open concept kitchen with ample cabinetry and counter space. Master bedroom features a private bathroom, garden tub and separate shower stall; mirrored closet doors. Spacious bedrooms and guest bathroom. Indoor laundry room includes washer and dryer. Extended carport, storage shed, great corner lot location. Live in this beautiful gated community. This community offers a library, swimming pool, pool tables and clubhouse for you to enjoy. Own the land as well as the mobile home. $75 HOA Fee and NO SPACE RENT. Spacious floor plan, bright white interior, new carpet. Large living room with lots of natural light coming through the many windows. Dining room features a built-in china cabinet. Master bedroom has a private bathroom and walk-in closet. Spacious second bedroom and guest bathroom. Laundry closet, 2 storage sheds, recapped roof and large carport. 7'x19' deck to enjoy your morning coffee. Sliding glass doors and great location within this gated senior community. The lot is approximately 3300sf. Lily Pigg - Realtor, SFR, SRES. BRE Lic #01927451. RS Real Estate Co. MLS #180007434. Exquisite remodeled home! Spacious open concept floor plan, wood laminate flooring, large deck to enjoy your morning coffee. Indoor laundry room includes washer and dryer. Large kitchen includes all appliances. Master suite offers a private remodeled bathroom. Large second and third bedrooms, beautiful remodeled guest bathroom. Storage shed, large carport and great location within this community. Lamplighter Village offers its residents state of the art facilities for their enjoyment! Live in one of the best senior communities of East County. Cameron's Mobile Estates is a beautiful senior community in Santee. This home is spacious, remodel and make it your own. Dining area features a built-in hutch. Kitchen includes appliances. Indoor laundry space, window air and central furnace. Master bedroom with private bath, guest bedroom and bath. Large living room and enclosed porch. Low space rent, call to see today! This home needs a complete makeover! 2 bedrooms, 1 den and 2 bathrooms. Very spacious home with views from living room, dining room and back deck. Large custom built storage shed. Ocean Bluffs Estates is a senior 55/40 community with luscious landscape, greenbelts, clubhouse, swimming pool and pool tables; located near the ocean. Stunning home in the highly desirable Highlands senior community. This home has been tastefully remodeled and is move- in ready. Two bedroom, two bath, bright and airy. Walls and ceilings have all been skim coated. Bullnose corners in living room, master bedroom and kitchen. Coffered ceiling in kitchen with LED lighting; newer counter tops, sinks and faucets. Entryway, hallway and bathrooms also have upgraded LED lighting. Gorgeous laminate flooring throughout. Guest bath offers a fully re-coated walk-in shower, newer vanity top, sink, faucet and toilet. Master suite features custom awnings on both windows. Master bath has the comfort of a re-coated tub-shower combo, newer vanity top, sink, faucet and toilet along with a separate dressing area. Dual pane windows with custom window coverings. Custom front door with retractable screen leading out to the large front porch. Relax, enjoy all the beauty this home has to offer! Call Shannon to view this home. 619-218- 9924. Highlands is an upscale resident owned senior community.